Bobo-Dioulasso is a city in Burkina Faso with a population of about 537,728 (as of 2012); it is the second largest city in the country, after Ouagadougou, Burkina Faso's capital. The name means "home of the Bobo-Dioula"; while it was likely coined by French colonists to reflect the languages of the two major groups in the population, it does not capture the complex identity and ethnicity of the location. The local Bobo-speaking population (related to the Mande) refers to the city simply as Sia. There are two distinct dialects spoken of Jula, based on the origins of different peoples who speak this language. The city is situated in the southwest of the country, in the Houet Province, some 350 km (220 mi) from Ouagadougou. Bobo-Dioulasso is significant both economically (agricultural trade, textile industry) and culturally, as it is a major center of culture and music. At the end of the nineteenth century, Sia consisted of two large villages, Tunuma and Sia proper, located a few hundred meters from each other on a narrow spit of land bounded by 10-to-15-foot-deep (3.0–4.6-metre) ravines on either side, carved by the We (Houët) river to the east and by its tributary Sanyo to the west. Three small satellite villages were located beyond this natural border. A number of other independent villages in the surroundings (Bindogoso, Dogona, Kwirima, Kpa) have been absorbed by the developing city and are now within its municipal boundaries and incorporated as part of the city. The two main villages were occupied by the French on September 25, 1897 after a brief but bloody confrontation. Soon afterward the French created an administrative settlement near them, on the east side of the We river. This became the headquarters of a district (cercle) of the same name, Bobo-Dioulasso. During the 1915-16 anti-colonial war, the population in the north and east of district Bobo-Dioulasso took up arms against the French colonial government. The French based their activities in the city in an effort to suppress the insurrection, while the city itself became a center for the organization of the suppression. A colonial military base was established in the southern sector of the city, adding to its growing importance. In 1927 the French razed the old village of Tunuma and the other settlements; their population was relocated either to neighboring villages or to a previously farmed empty zone 3 kilometres (1.9 miles) away. It was made available for redevelopment as a residential neighborhood (the current neighborhood of Tounouma). Sia proper, which survives today as the Dioulasoba neighborhood, was partly spared this total destruction. It was dramatically modified in 1932 when a large road artery was built through it and by the widening of streets in successive urban renewal projects. Between 1926 and 1929, the French colonial government constructed a typical European grid pattern of new avenues and streets in the city, intersected by diagonals radiating from a center, with square urban lots between them. This established the framework for the modern city center. The Abidjan Railway reached Bobo-Diouolasso in 1934, increasing its access to markets, transportation, and communications. But the growth of the city as a colonial industrial center halted because of the world economic crisis during the Great Depression, as well as the suppression of the colony of Upper Volta in 1933. The city started expanding again after World War II. Reorganization of the colony of Upper Volta in 1947 attracted business to Bobo-Dioulasso, although Ouagadougou had been selected as the capital. An early industrial center, Bobo-Dioulasso is also the hub of a rich agricultural zone, which produces food grains, fruits and seedlings (mangos, citrus), and export crops (cotton, cashews, and the gathered oil seed karite/shea). Due to its strong economic contributions, following the nation's gaining independence in 1960, the city was called "the economic capital of the country" (as opposed to the administrative capital, Ouagadougou). Bobo-Dioulasso's economic advantage vis-à-vis the capital has declined following decades of government policy favoring Ouagadougou. Little new industry arrived in the city during the 1980s and 1990s. Some enterprises either closed down or relocated to the capital. Economic life was primarily reduced to commerce grounded in the agriculture of the region and services. Since 2000 the city of Bobo-Dioulasso has engaged in a new growth spurt, gaining in population and economic vitality. Residents have returned home following the internal crisis in neighboring Ivory Coast, and the economy has been stimulated by new demands for its goods. The central government has invested more development funds in the city; for example, the new West African Centre for Economic and Social Studies is a college intended as the first piece of development of the second university of the country. Dafra, a sacred natural pond and the source of the We river, in its southern quarter. The pond is a site of pilgrimage. People make offerings consumed by the giant catfish living in it. 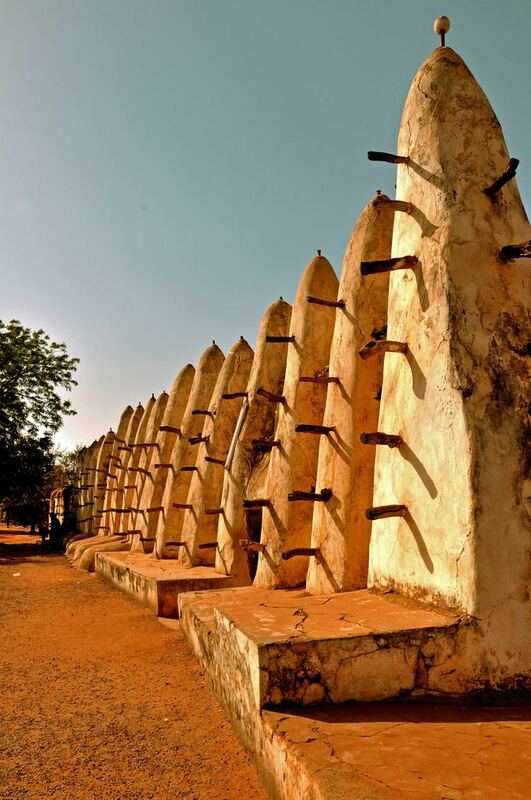 Bobo-Dioulasso has well-preserved examples of the colonial-era architecture in what is called "neo-Sudanic" style (examples: the museum building, the train station). A regional museum interprets the long history and artifacts recovered in archeological work. A zoo and a pottery market are among the city's attractions. The Polytechnic University of Bobo-Dioulasso is located in the city and in 2010/2011 it had around 2,600 students. The École française André Malraux, a French international school, has maternelle (preschool) through collège served. The city has a railroad station along the Abidjan – Ouagadougou Railway. As of June 2014 Sitarail operated a passenger train along the line three times a week in each direction. As of August 2015 Bobo Dioulasso Airport had direct flights twice a week to both Abidjan and Ouagadougou. The city is an important road junction connecting all of Southwestern Burkina Faso with the capital, Ouagadougou, via the N-1 roadway. The original population of Bobo-Dioulasso consisted of a majority of farmers speaking the Bobo language. Associated with them were groups specializing in trade and warfare; they also speak Bobo, but identify as of distinct historical origin and ethnicity. They call themselves the Zara. Today Bobo-Dioulasso is ethnically and linguistically very diverse, due both to its position as an old trade town, and especially to its growth during the twentieth century as a colonial administrative and military center. Jula (also called Dioula) is the lingua franca of Bobo and surrounding region of western Burkina Faso. People of the city and region speak two distinctive dialects of Jula. The common (and now dominant) Jula spoken in the streets of Bobo-Dioulasso is a close variation of Bamana, the majority language of neighboring Mali. It was brought to the area during the French colonial administration (1898–1960) by the government interpreters and by the soldiers of the colonial army, who were majority speakers of this language. Most people speak this Jula as a second language, after the official language of French. The people of Jula ethnicity, whether trader, Muslim-clerical, or warrior origin, speak a different dialect of Jula. It is similar to that spoken in Ivory Coast, from where their ancestors are believed to have come. In the city this dialect is called Kon-Jula; it is an ethnic marker of a particular community. Classified by Köppen-Geiger system as tropical wet and dry (Aw). During its hottest months, its temperatures are slightly less hot than the more northern capital, Ouagadougou.